← When Will We Stop Profaning the Holy Mass? It’s not rocket science. There’s no need to reinvent the wheel. We don’t have to hold dozens of conferences and spend hundreds of hours and thousands of dollars trying to develop a twenty-first century strategy. All the Catholic Church needs to evangelize a highly secular and increasingly hostile world can be found right there in our very tradition. We already possess what we need; the only thing lacking is faith. Truth. Beauty. Goodness. The Church has always understood the necessity of each. Much like the Holy Trinity, these three are distinct, but they are also one. The story of the post-conciliar years has been in many ways all about the loss of that which is true, beautiful and good. The truth has been buried underneath such errors as indifferentism, false ecumenism, and immanentism. We have allowed ourselves to be treated as simply one of many Christian denominations. This is patently false. We are not merely one of many ideas competing in a religious market place. The Church and the sacraments are the means by which grace enters the world and souls are saved. Beauty has largely disappeared from the faith as well. That which is objectively beautiful (and we know this because it has survived centuries and transcended cultures) has been viciously assaulted by modernists for decades. Altars smashed, communion rails ripped out, timeless Gregorian chant and traditional hymns replaced instead by banal folk songs which have already become outdated works of a disobedient generation. The Good has also suffered from this loss of faith. Just as the Holy Spirit proceeds from the Father and the Son, that which is good proceeds from truth and beauty. As the world increasingly embraced lies and the ugliness of sin, the Church, abandoning clarity and confidence, often responded instead with ambiguity and minimalism. When triumphalism was needed most, we got aggiornamento. As I said in the beginning, the answer to this crisis of faith, this lack of truth, beauty, and goodness can be found in our tradition. Eucharistic processions, adoration, exposition of the Blessed Sacrament, organized public rosary rallies. As one friend recently put it: Catholics doing Catholic stuff. 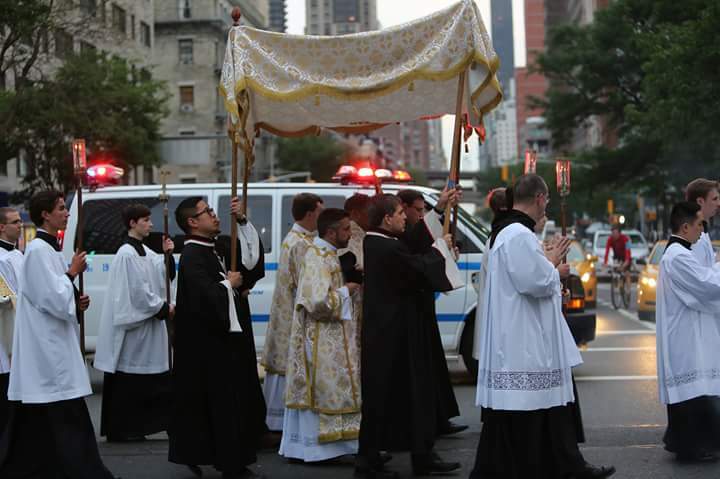 There is no better way to meet people where they are (literally), than to take Our Lord to them in a Eucharistic procession. We need to take Christ out of all the tabernacles of the world and process Him through the streets. Christ in the monstrance. Our King on His Throne. The radical, secular, left is not looking to compromise. There is no culture war. It is a cultural revolution. The devil doesn’t want to coexist with Christ. As those who hate Our Lord have grown in confidence, we have retreated. With that retreat from the battlefield, we have taken Christ with us. Once there was a world where processions were frequent and the faith lived, shared, and boldly proclaimed. If you wanted to see Christ, you only had to look up….even out in the streets…and you would see Him. Actually see Him. It’s not rocket science. There’s no need to reinvent the wheel. Look to our tradition, to that which is true, beautiful, and good. And let’s start being Catholic again. Posted on May 27, 2016, in holiness, liturgy and tagged beauty, Catholic truth, Catholicism, Corpus Christi, Eucharistic procession. Bookmark the permalink. 29 Comments. I like it. I’ve been busy being Catholic for as long as I’ve been a Catholic. If I’d wanted something else, I’d have stayed as I was. I pray we can induce other Catholics to do Catholic stuff. With some of them, it’s like urging them to try a new food or read a book you know would help them. They would rather not change. I’m not Catholic… but I do have faith that our Lord will provide me with what I lack. The Lord provided you with His Church. It’s what you lack. Maybe you’ve never heard the story of God sending a helicopter. Best to say that she is “catholic” without being “Catholic”. That capital letter regards affiliation, not validity. It takes a lot of gall to equate Rome with Christ’s bride. The church is not a structure, hierarchical or otherwise. It is a group of true believers. Only God and each person know who is a member of that body and who is not. What does he lack? If he accepts Jesus’ sacrifice as paid in full (“It is finished!”), then he lacks nothing. Catholics doing Catholic stuff: Corpus Christi at St. Mary’s, Norwalk, Connecticut, USA: May 29, 2016. Along with a visit by Benedictine Monks of Norcia , Italy. The homily was given by Very Rev. Cassian Folsom, O.S.B., prior at Norcia. In the liturgical role of subdeacon, Fr. Benedict Nivakoff, sub-prior (who is from the nearby town of Darien, Connecticut) sang the Epistle. In addition to Fr. Cassian, another member of the community (Bro. Joseph?) also sat “in coro”, along with a diocesan seminarian and the parochial vicar, Msgr. Ignacio Barreiro. Liewise assisted by Benedictine Monks of Norcia , Italy. Approximately 1/3rd of the parishioners at St. Mary’s are from Latin America, so some of their traditions were included, e.g. a brass religious marching band and a fireworks display before re-entering the church. (Legal fireworks in Connecticut are very restricted, so the display was very tame compared to what actually takes place in some Latin American Corpus Christi celebrations.) One photo shows just the clergy, servers, choirs and band walking down the main street; the congregation (not pictured in that photo) made the entire procession at least 3 times as long as pictured. BTW, the photo at the top of your article includes a number of servers from this parish, which is only c. 30 minutes away from New York City. Fantastic links Christopher. Thanks as always for your comment! I am trying to understand where you are coming from. I love devotionals as much as anybody, but I think a pretty straightforward reading of the Gospel reveals that “Catholics doing Catholic stuff” ought to be firmly expressed by living out Catholic Social Teaching. I don’t see much mention of that here. >>HOWEVER, liturgy ALWAYS has been the source from which all Catholic teachings are handed on and then practiced: ‘Lex orandi, lex credendi, lex vivendi’. If we don’t get the “orandi” part right, then the rest—including putting Catholic social teachings into practice—will falter. To Brian June 1, 2016 at 3:08 pm. Catholic social teaching has been going on since the beginning of time. However, we have dropped our visual identity since the 1970s. Perhaps we have hidden our brand and because of it, lost who we are. The beginning of the time of The Church, that is. Yes, doing Catholic stuff – maybe applicable on the clerics, too. Many have been alienated from the church – owing to some factors; many have seen the end of the “vow of poverty”, even the “vow of chastity”. Gone are the days when we can just approach a parish priest and kiss their hands, as they wait and chat with their flock, not like some celebrity of high standing. . Of course there are still those who still are, but … I miss those days when I can still feel an aura of blessedness and religiosity whenever I’m with them. Sad. Just sad. I had witnessed some in their journey from philosophy to theology, till their ordination. But I also witnessed their transition from humility to ostentatious lifestyle. Maybe, if they can get back to doing catholic stuff, too…things would be different. This blog is the perfect summation of what we as the One Holy Catholic and Apostolic Church must do moving forward, without fear of consequences. Let’s reclaim our authentic true catholicity, starting now! Where is God’s grace? Where is the essential message that Jesus bought us with His death, and our debt of sin is paid in full? Sola gratia! JESUS is my beauty. JESUS is my truth. Solus Christus! By my faith alone, granted by the Holy Spirit as a free gift, Who through me causes the fruit. Sola fides! Forget the traditions of men. Sola scriptura! Then when I celebrate with the liturgy in my Lutheran church, I feel JOY. I am incapable of completing my sanctification in purgatory or anywhere else, and it would be blasphemy for me to try. Jesus did it all. “It is finished!” To God be the glory. Soli Deo gloria! Recapture that message, and you will once more speak to humankind. Without that, it is empty ceremony. patg2, my oldest sister left the Catholic Church and became Lutheran. While she came to love the congregation she was in, she realized that she had been listening to outsiders & was ignorant of the reasons for her faith. Once she began examining the claims, doctrines & history of the two, she left Luther’s church & returned to the Church Jesus founded. Interestingly she said that the Lutherans were better at physical community, but Catholicism better understands & lives out our adoption into the family of God at the mystical level. We are not saved by faith, but by grace – faith is a gift of grace. Scripture affirms this. You have not heard this message because apparently you only read Catholic articles selectively, but it is clearly stated in the Catechism of the Catholic Church. You can find it at any number of sites online. You might also check out catholic.com to get some idea of how the Church has responded to the Protestant claims. You might also consider the fruit of reformers such as St Francis of Assisi vs Luther’s legacy. Francis inspired conversions, reversions, religious vocations & countless new congregations; Luther inspired a large number of Christians to design their own beliefs and start their own churches, attaining to a DISunity of the faith that, inspired by his “divorce” has led to thousands of new do-it-yourself forms of Christianity & pseudo-Christianity. Clearly Luther’s idea of reform doesn’t conform with God’s. A lot depends on WHICH Lutheran group your sister went to. There are a couple of apostate groups of some size, and you won’t get solid teaching there. The fact that you think in terms of adoption into the family of God at the mystical level is a real warning sign to me. God wrote in the Bible that this thing was not done in a corner (it was done openly and simply) and that secret things are shameful. Everything we need to know about salvation is made quite clear, no mystical aspect about it. I’m not looking for mystical. I am not interested in mystical. I have seen too many deadly spiritual traps with that consideration. and I won’t go there. My relationship with my Savior is very, very simple. He died for me. I am welcome into heaven the moment I die. Praise God! As for your comment about grace and faith, of course faith is a gift. But it is by grace THROUGH faith. They are BOTH involved. Trying to split the two makes absolutely no sense. Sola gratia, sola fides! The CHURCH that Jesus founded is the collection of all true believers in Him. We are His body. The Bible makes this very clear. It is not an ecclesiastical organization with an earthly membership. What Luther needed to do was because of new dogmas that clearly contradict Scripture. He is not responsible for what other people did to found “churches”, and there have always been such groups, and in the past, Rome suppressed them by killing the leaders. The only reason Luther succeeded was because of the newly invented printing press, and the fact that certain German princes protected him. It is not Francis of Assissi’s job to inspire conversion. That’s the Holy Spirit’s job. It is also a warning signal that people give him credit for the Holy Spirit’s work. You are making too many assumptions. I have read Catholic literature widely. I have nothing to learn from any earthly organization that teaches that I can do a better job of completing my sanctification than Jesus could. That’s what it means to have to go to Purgatory to cleanse and sanctify me. In other words, that says that my sanctification is completed by MY suffering, not the suffering of Jesus on the cross. That robs GOD of the glory that belongs to Him alone. But Jesus said, “It is finished!” If I believe that I must complete my sanctification, then I am calling God a liar. I won’t go there. Thank you for responding. Happy Reformation Day! Your response to the use of the word “mystical” is somewhat baffling – is your only familiarity with it related to the occult or something? Merriam-Webster defines “mystical” as “having a spiritual meaning that is difficult to see or understand; having a spiritual meaning or reality that is neither apparent to the senses nor obvious to the intelligence; resulting from prayer or deep thought; involving or having the nature of an individual’s direct subjective communion with God or ultimate reality”. If you don’t like or are afraid of all that which is mystical, then I’m afraid you are rejecting all forms of intimacy with God and the spiritual reality. And if being adopted on the material plane by the Supreme Being and made one with the rest of His family which exists in both the physical and spiritual realms isn’t mystical – something we limited humans can only understand at a relatively superficial level & only because He revealed it to us – then nothing is. Galatians 4:5-7 – to redeem those who were under the law, so that we might receive adoption as sons. And because you are sons, God has sent the Spirit of his Son into our hearts, crying, “Abba! Father!” So through God you are no longer a slave but a son, and if a son then an heir. Romans 9:8 – This means that it is not the children of the flesh who are the children of God, but the children of the promise are reckoned as descendants. Galatians 3:26-29 – for in Christ Jesus you are all sons of God, through faith. For as many of you as were baptized into Christ have put on Christ. There is neither Jew nor Greek, there is neither slave nor free, there is neither male nor female; for you are all one in Christ Jesus. And if you are Christ’s, then you are Abraham’s offspring, heirs according to promise. Romans 8:23 – and not only the creation, but we ourselves, who have the first fruits of the Spirit, groan inwardly as we wait for adoption as sons, the redemption of our bodies. 1 John 3:1 – See what love the Father has given us, that we should be called children of God; and so we are. The reason why the world does not know us is that it did not know him. 1 John 3:2 – Beloved, we are God’s children now; it does not yet appear what we shall be, but we know that when he appears we shall be like him, for we shall see him as he is. Generally speaking, although Missouri Synod has had its share of problems, I wouldn’t regard the entire synod as apostate, though there are individual congregations that effectively are. I think it’s a shame your sister didn’t get more experienced with LCMS. As for mystical, here’s part of what I don’t like: “resulting from prayer or deep thought; involving or having the nature of an individual’s direct subjective communion with God or ultimate reality” What this suggests to me is things like contemplative prayer and similar practices. It also suggests experiences in which we are DECEIVED by demons impersonating someone we might like to see (such as Mary). These are spiritually VERY DANGEROUS. As for your adoption example, I’m speechless! There is nothing whatsoever that is mystical about adoption. We have four adopted children in our family, so I am thoroughly familiar with all the aspects of adoption. And by the way, I breastfed the two my husband and I adopted. Nothing mystical about that, either. I am not looking for: “If you don’t like or are afraid of all that which is mystical, then I’m afraid you are rejecting all forms of intimacy with God and the spiritual reality.” God is completely in charge of this aspect of my life. I do not require some kind of emotional description of “intimacy with God and the spiritual reality”, whatever that means. It is very simple. Jesus paid the ENTIRE PRICE of our sin. If we RECEIVE and ACCEPT His sacrifice as total payment for our sins, and as complete for purposes of sanctification, we are God’s children and we will go straight to heaven at death. If we try to augment this in any way whatsoever, we are trying to do God’s job, and this is blasphemy. And the Roman church has all sorts of ways in which people attempt to augment their sanctification, including holy living and purgatory. Mystical is anything BUT simple. But Jesus has told us that little children can understand. So it is definitely NOT mystical. To get back to what this article is about, what is the point of carrying a statue of Jesus through the streets? If you don’t TELL people what Jesus has done for us, Who He is, and so forth, the statue has no meaning. It is the Holy Spirit’s job to draw people to Christ, and Christ Himself promised to draw all people to Himself. We are simply assigned the task of conveying information (which a parade through the streets is pretty devoid of, frankly), praying for people, being kind to them in Jesus’ name, and so forth. I find nothing compelling about this practice, even though I love anything that gives me an idea of God’s glory, such as the interior of a magnificent church building, or the sound of a magnificent organ, or quoting the Bible through liturgy. Where do you get the idea that spiritual adoption into the family of God is no more different than adoption of a human baby by a human family? Where do you get the idea that contemplative prayer is on par with locutions, let alone demonic attempts at false & misleading apparitions and the like? While prudence is a virtue that we are all called to cultivate, you seem to have a strangely disproportionate & hyperscrupulous fear of the metaphysical. Perfect love casts out fear! Sorry, but to get back to what this article is about is impossible – talking with you about Eucharistic processions is somewhat like trying to talk college football brackets with someone who has no idea how the game is even played. You can’t appreciate something about which you have so little knowledge. I am saying that human adoption is a symbol of God adopting us into His eternal family. It is sufficient explanation that I don’t need to add any mystical connotations. I am not afraid of the metaphysical. Instead, it brings an sensation of stench. I would avoid it like I avoid stepping in a cow pile. “Perfect love casts out fear” is misapplied here. I spent a lot of time in early adulthood exploring the metaphysical and found NOTHING of value in it. Not one iota. Essentially, your responses are loaded with ad hominems. That tells me that you are having difficulty countering my statements. Remember, you accused me of being dishonest and then you ignored my response. Try addressing the ideas I present, rather than attacking me personally. patg2, while I am more than willing to engage with you in further discussion of our differences, after reading the rest of your comments, I am not inclined to invest more time unless it is an honest discussion with actual dialogue rather than an anti-catholic “debate” (ie, a one-sided effort mischaracterizing my words from their context & telling me what you mistakenly believe Catholics believe). The Lord tells us that it is better that we “prove” our beliefs through virtue than arguments. 1 Timothy 6:20 … guard what has been entrusted to you. Avoid the godless chatter and contradictions of what is falsely called knowledge, for by professing it some have missed the mark as regards the faith. Grace be with you. Remind the believers of these things, charging them before God to avoid quarreling over words; this is in no way profitable, and leads its listeners to ruin. It reads to me like you are subtly questioning my honesty. You think what I am doing is not an honest discussion. On what basis do you judge the sincerity of my heart? I do not intentionally mischaracterize your words. If I have done so unintentionally, please point it out to me. As for what I “mistakenly” believe Catholics believe, all I can say is that I go directly to primary source material or talk to actual Catholics, and I ATTEMPT to read these things accurately, or hear what they say accurately. Obviously, it is your decision no longer to talk to me, but please don’t pretend I DID something to be less than honest in my discussions. If you think I have been dishonest, show it with your examples. I don’t feel chastised by your Bible verses for having written to you, because I do not bear the animosity you accuse me of. Primary source material: Baltimore Catechism, Catholic Encyclopedia, Encyclicals. I am not questioning your honesty, but rather your intent. You appear to be interested only in your own point of view of Catholicism regardless of its accuracy. Here is a hyperbolic – yet true – example of how anti-catholicism works: A man who professes to be SDA posts a comment following a Catholic article accusing us of worshipping the sun. He proceeds to “prove” it by pointing out the early Church’s long tradition of worshipping facing the east – where the sun rises. When he is shown several Scripture verses upon which this tradition was based, and it is also pointed out that we only face east with the direct intention of worshipping the Son not the sun, he proceeds to inform us that we are mistaken on both counts – he knows better than us who we are worshipping. None of your accusations against Catholicism are found in any of the Catechisms; rather you are posting YOUR take on what you read. An unoriginal take, btw, that has been taught only since Luther’s divorce (and we all know how God feels about divorce). Tell me, have you yet encountered one of the many militant atheists online? These are the folks who will tell you that you do not worship Jesus, but an old myth about a pagan god who died and then was resurrected. When you dispute it, they will tell you that you are just ignorantly & naively falling for the same myth in a different guise because you don’t know any better – you are not as enlightened as they are. If you cannot perceive how your approach is similar nor understand how offensive it is to tell someone that they believe what you say they do, rather than what they tell you they believe, then yes, this is useless and will only continue downhill from here. OK, I accept that you are not questioning my honesty, but I have a hard time imagining you aren’t aware people tend to speak from their own perspective rather than that of a stranger. It’s the way we are! I have a different perspective from you, and I talk from that perspective. Sometimes outsiders see things we miss because we are too involved in a decided point of view. Interesting you should bring up SDA. I have had a very similar discussion with SDA members, and I’m on YOUR side on this one. The early Christians worshiped on Sunday because Jesus rose from the dead on Sunday. It is the Lord’s day, and Jesus is my Sabbath rest. I had a rather extensive and deep involvement with SDA at one time (as an outsider). Eventually, I won what I sought from that situation. I haven’t encountered that particular accusation from an atheist. I suspect our offensiveness is mutual. Your approach is much more argumentative and hostile than I would expect, and I certainly don’t feel that strongly against you. We need a new Catholic church. Ours is too corrupt. One that really treats us equal and does as Jesus instructed. All we need is a “good” Catholic priest to get us going. They had one. His name was “Martin Luther”. Just sayin’.